Dips in Bitcoin and the aggregate crypto market continue to get bought up – and the Mirrored Foldback pattern shows that we should continue to move higher in the short term. It has to be a source of discouragement and frustration for all perma-bears and those who have (unwisely) decided to convert to a bear. Ever since the large spike up on April 2nd, bears have attempted to short Bitcoin down. The pressure they have made has not been insignificant either. But the behavior of the participants has clearly shifted to the bullish side. Any dips in Bitcoin have continued to been bought up. In fact, even though the majority of the intraday trading over the past week has been bearish and/or flat, there has only been one daily candlestick close that was lower than the daily open, and that was on April 4th. I would expect Bitcoin to continue its rise over the remainder of this week. The constant and consistent pressure higher is really putting a squeeze on short traders. It becomes a sort of disease that eats itself. In trading, we call this kind of behavior a ‘short squeeze’ this occurs when a large number of traders have attempted to short an instrument, but prices continue to move higher. What happens is that some of the early bear traders who attempted to short instead have to ‘cover’ by becoming buyers. Those new buyers are now in a pool of other traders who have already been bullish. And as prices continue to go higher and higher, more and more short sellers must cover by becoming buyers. Short traders can literally cannibalize each other and create a massive spike in price. We are seeing evidence of this kind of behavior occurring right now. The ‘Foldback Pattern’ was a pattern and behavior discovered by Michael Jenkins. Essentially, a foldback pattern is where prices repeat the same swing structure form the past. On the chart above, we can see two orange boxes. The first box is highlighted to display the date and price range. This exact box is copied next to it. The black hash lines represent the price action from the first box – and then it’s ‘reflected’ into the second box. The purpose of a foldback pattern is to assist with forecasting and predicting future price moves. Now, it is important to recognize that we’re not looking for the exact same price action to repeat. What we are looking for is the same swing structure – specifically major swings. 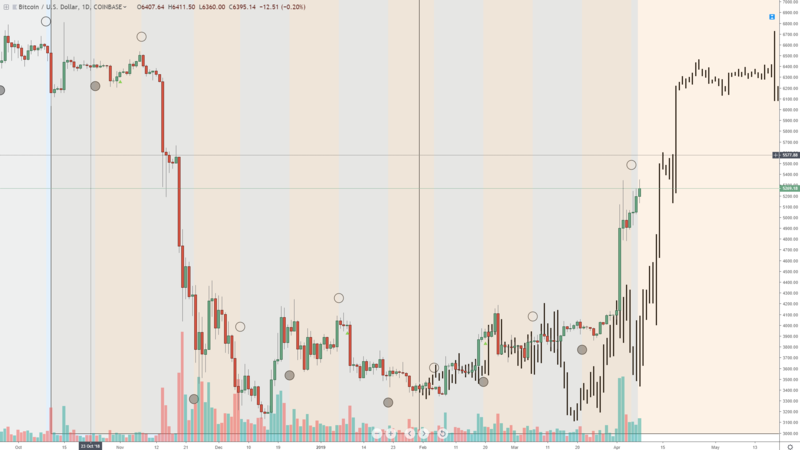 If we look at the foldback pattern compared to the current price action, we can see that the two ascending higher low and the corresponding higher moves have been completed. But if we look at the major move from the foldback pattern, we’re looking at a much higher swing towards the $6k value area. Considering that the 50% time interval in the current Law of Vibration cycle is on April 12th – and that there is a New Moon phase on April 5th, a predictable price target for the end of the week is the $6k value area before a deeper pullback would be warranted.